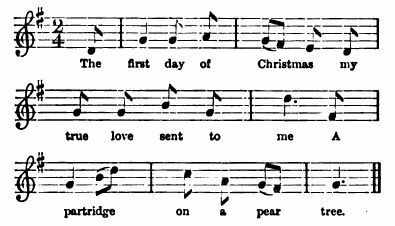 Source: John Stokoe, "The Twelve Days of Christmas" in the continuing series of articles titled "The North=Country Garland of Song," appearing in The Monthly Chronicle of North-Country Lore and Legend, Vol. II, No. 11 (Printed and Published for Proprietors of the "Newcastle Weekly Chronicle" by Walter Scott, Newcastle-On-Tyne, January, 1888), pp. 41-42. 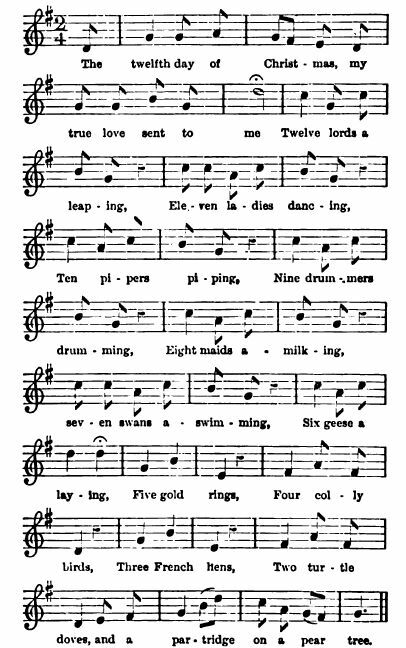 Songs relating to festivals and customs possess a special interest not adequately measured by their poetical pretensions ; and such good old carols as the "Twelve Days of Christmas," although now banished to the nursery, were formerly great favourites, and were played as forfeit games, each player in turn having to repeat the gifts of a day, incurring a forfeit for every mistake. The music of the first and last verses only are given, and it will be observed that each verse not only celebrates the gifts of each day, which are accumulative, and requires a good memory on the part of those who make their first attempt in it as a forfeit game. The tune for each gift is the same in all repetitions, so that the last verse contains the whole of the music. A partridge on a pear tree. Two turtle doves, and a partridge on a pear tree. Three French hens, two turtle doves, and A partridge on a pear tree. Four colly birds, three French liens, Two turtle doves, and a partridge on a pear tree. Five gold rings, four colly birds, three French hens, Two turtle doves, and a partridge on a pear tree. Six geese a-laying. five gold rings, Four colly birds, three French hens, Two turtle doves, and a partridge on a pear tree. Seven swans a-swimming, six geese a-laving, Five gold rings, four colly birds, three French hens, Two turtle doves, and a partridge on a pear tree. Eight maids a-milking, seven swans a-swimming, Six geese a-laying, five gold rings, Four colly birds, three French hens, Two turtle doves, and a partridge on a pear tree. Nine drummers drumming, eight maids a-milking, Seven swans a-swimming, six geese a-laying, Five gold rings, four colly birds, three French hens, Two turtle doves, and a partridge on a pear tree. Ten pipers piping, nine drummers drumming, Eight maids a-milking, seven swans a-swimming, Six geese a-laying, five gold rings, Four colly birds, three French hens, Two turtle doves, and a partridge on a pear tree. Eleven ladies dancing, ten pipers piping, Nine drummers drumming, eight maids a-milking, Seven swans a-swimming, six geese a-laying, Five gold rings, four colly birds, three French hens, Two turtle doves, and a partridge on a pear tree. Twelve lords a-leaping, eleven ladies dancing, Ten pipers playing, nine drummers drumming, Eights maids-a-milking, seven swans a-swimming, Six geese a-laying, five gold rings, Four colly birds, three French hens, Two turtle doves, and a partridge on a pear tree.